“Combo” and “Batch” are the newest modules to be released in the latest update of the TKActions V6 panel. The RapidMask2 V6 module was released in October 2017. With the release of these two new modules, the V6 panel is now complete. The new Combo module comes in two versions: Combo and ComboX (also designated Cx). The different arrangements have identical functions, but they make it possible to create two very different workspaces to utilize the V6 panel. This is explained in the “Custom V6 Panel Workspace” video at the end of this blog. The Combo module combines the Control and Action modules of the V5 panel into one. This continues the evolution away from the button-crazy, multi-mega-panel design trend to a more compact, efficient, and logical workspace that started with RapidMask2. Most users will now need just two modules in order to access V6 functions: the RapidMask2 module makes all the different luminosity masks and Combo runs Photoshop. 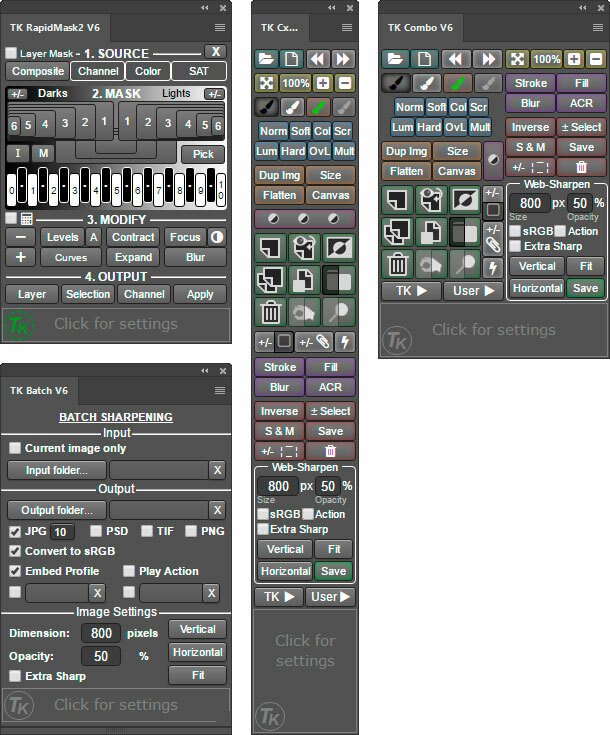 The V6 modules use smart menus to replace confusing tabs and even entire panels. A good example is the “TK ▶” button. It opens a menu that contains all the actions of the V5 Actions module plus several new ones (image below). While these actions can be extremely useful when developing images, it’s not necessary to have them in a separate panel given that they are used one at a time and generally only occasionally during processing. The smart menus in the Combo and RapidMask2 modules track what’s happening and automatically close once they’ve served their purpose. Below is a short list of the features of the new Combo/Cx modules. Compact design−Combines the all features, functions, and actions of the V5 Control and Actions modules into one. Run Photoshop from the module−Many common Photoshop functions, keyboard shortcuts, and menu items can be run with a single button click from the module. Multi-function buttons−Several buttons have dual functions that are graphically displayed on the button itself. Use the “TK ▶” button to access the creative Photoshop actions menu−Includes new actions for Smart Orton and Neutralize Cast 2 for creative development, and Stack, Align, and Focus Blend for blending multiple exposures. Integrated web-sharpening−Sharpen images for the web to any dimension, convert to sRGB, and run post-sharpening actions with one click directly from the module. Expanded user actions−Ten programmable actions, accessed via the “User ▶” button, allow users to run their own actions directly from the panel. This update also includes some additional enhancements to the RapidMask2 module that was released in October 2017. Advanced Mask Calculator−Any mask created using the panel can be added, subtracted, and intersected with any other mask. This makes it possible to combine luminosity, color, saturation, modified, and even user-created masks in any manner desired. There is also an Advanced Mask Calculator in Layer Mask Mode so users can see the results reflected immediately in the image itself. Enhanced “Pick” button−The Zone mask that is picked is highlighted directly on the panel. This makes it easy to experiment with adjacent or nearby zone masks to see if one of them might work a bit better. Properties panel toggle−Creating an adjustment layer automatically opens the Properties panel so that the desired adjustment can quickly be made. This feature is also active when using the Combo panel to create adjustment layers. The Batch module is also part of this release. It resizes and sharpens entire folders of images for web presentation. It may not be used frequently, but can be huge time-saver when there are lots of images to sharpen. The videos below provide a brief overview of the V6 panel. Additional information can be found on my website. The comprehensive instructions PDF for the V6 panel can be downloaded here. To purchase the V6 panel plus other panels and videos, please visit the Panels & Videos page. Don’t forget to use the V625off discount code. It also works on Sean Bagshaw’s videos listed on that page. I currently have the V4 panel and was wondering if there are any discounts available for upgrades to the V6. Definitely enjoying the fruit of your efforts on the panel. Chris–Feel free to use the “V625off” discount code. It’s the best discount I currently offer. Does this work in Photoshop CS6? It does almost all of what the V6 panel can do, but uses more modules since the smart menus aren’t possible with CS6 extension panels. That’s just amazing all the improvements you made with the V6 panel. I am still a beginner using your TKActions, but can see clearly its potential. I am looking forward to improving my postprocession thanks to this great help. I believe your version6 is for PS CC only. Just checking as I am still a CS6 user. I am starting to get [upset] not from your self, but myself for taking a donkey stand for not upgrading to PS cc based on a principle I have set against the adobe subscription business model. I will bite the bullet soon. There are a couple of other add ons that have ended up taking the same direction as yourself that there latest updates are only CC based. Yes, the V6 panel only works in Photoshop CC. While I understand the frustration with Adobe’s business model, the reality is that PS CC provides a much more robust development environment for extension panels. The sprawl of the V5 panel was directly tied with wanting to make it as identical as possible for both CS6 and CC. Once I made the decision to move away from that concept, I was able to make the V6 much more compact while also adding greater functionality. If you do update to CC, Al, be sure to contact me.